Original cover by Ryan Dunlavey; Marvel 2009. Ryan Dunlavey's website is here. Damn...you beat me to covering myself by covering yourself! 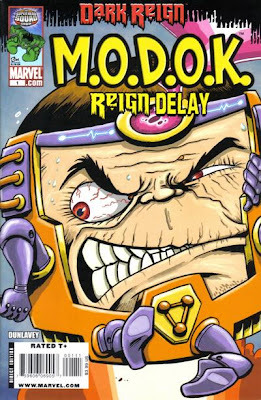 Love it....MODOK fans will rejoice!! I'd love to know how you came about doing a M.O.D.O.K. comic. I can just imagine you thinking, so... I can do a M.O.D.O.K. comic and you aren't going to sue me, in fact you're actually going to pay me? And I get paid for writing, drawing, and inking like they are three different jobs?! As a fellow indie cartoonist, this all blows my mind a little bit. Yeah, this whole thing has a great back story. Love the bold striking colors on this. Some people at Marvel were fans of Action Philosophers and since Fred Van Lente was already under contract with them they asked us to pitch a humorous one-shot as a digital exclusive. Fred knew they were doing a big villain-centric crossover so we decided to run with that and MODOK was the natural choice for a lead character - I sketched out a few gags including "MODOK DEMANDS PANCAKES!!!" and it got green-lit pretty much immediately. Fred and I were supposed to co-write it with me also pencilling & inking, but Fred got too busy writing other Marvel stuff so I wrote it solo. Then I told them I could color and letter as well and for some reason they let me do all that too, which was great because I *really* needed the money. At some point they decided to make a print comic instead of digital. Horray! That's great. They must have thought you were some kind of renaissance man by doing everything. I'm glad they printed it. Awesome Ryan! Congratulations! BTW, I love the new "cover" it's guevara-rrific! 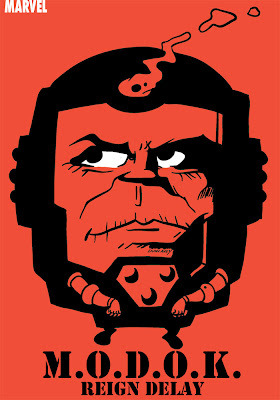 Well, you know me, I love everything MODOK and glad to see the Che version of the cover. I enjoyed seeing the original art when it was hanging up at Rocketship a few years ago, Ryan.